One major issue I had last year was that I never provided any kind of coherent organization for all the notes, handouts, and worksheets my students had to keep track of. For all but the already-super-organized student, what resulted was that my class often felt disjointed and scattered. Which makes sense, because that’s exactly how I felt. But, hey, it was my first year teaching, and I did my best! So reason #1 for me to start using some kind of lab notebook was simply so that students would have (mostly) one place for (almost) everything they do in my class. Reason #2: I wanted my kids to do more writing. Being able to clearly communicate an idea in writing helps develop and show deep understanding. I cannot rave enough about how awesome this book is. I’m not even implementing half of what Kellie Marcarelli talks about, and I’ve already begun to see how much a difference it’s made in my class. What I love most about this book is that the techniques can be applied for both middle and high school science classes alike. All in all, I’m implementing a baby-steps version of the ideas presented in the book. Still, I’m beginning to see some pretty fantastic results. I made handouts for the first few pages of students’ notebooks. Kellie suggests taking at least one full class day to set these up, and she’s definitely right about that. You can see what each of these look like on my class website. I mostly wanted the first few pages to be a reference for students to use on how to do lab-related stuff thoroughly and accurately without me having to answer “is this good enough?” questions over and over. The thinking selfie is what I’m particularly proud of. Kellie has an entire chapter on student buy-in to notebooks, and she suggests having students put a picture of themselves as a way to personalize their notebook. I took one more step and made it a bit silly by asking them to take selfies of their most intense thinking face. Many students wanted to take group pictures, which was totally fine with me. They were having fun with it, which was my goal. I found it helped to embarrass myself a little. In her book, Kellie Marcarelli outlines a mountain of creative and effective ways to use these notebooks. Even though I feel as if I’m only scratching the surface, I can already see huge differences in my classes, both AP and college prep. 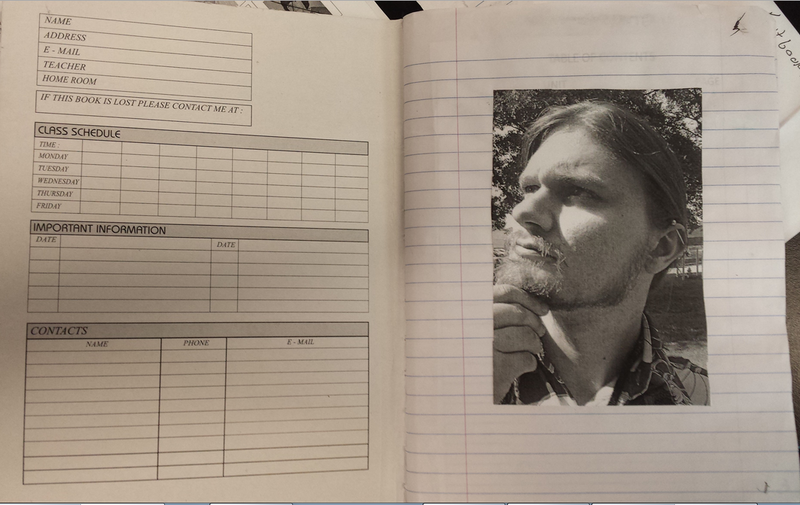 At the beginning of each day, I put an example version of what their notebook should look like for the day. Thankfully, we have a document camera, so this makes it rather easy. This could also be easily accomplished with just a sketch on your whiteboard. Students come in, copy the framework into their notebooks, and they’re good to go. Also, having an example notebook is great for students that missed class. They can come in, find my version of the notebook, and have a jump-start on making up what they missed. Having a structure to follow each day has helped tremendously with how fragmented my class felt last year. Ok, so, my handwriting could use some work. And many other iterations of equally vague (well, vague for a physicist) responses. So why ask it, then? To give them (and me) a track record of their thinking! The activity for that day was that students were to design an experiment that would determine if a motorized buggy cart I gave them moved with a constant speed. I’ve documented some initial and revised responses to this question towards the end of this post. This gives me a concrete record of how each student’s ideas on this particular topic develop lesson-by-lesson. I could collect these, read them, and adjust my instruction as needed (and I”ll do that eventually). Can we say “formative assessment?” Yup. This also allows students to have a track record, which is great for promoting metacognition tasks, which I’m also focusing on this year. But that’s for another post. At the end of (almost) every day, I ask students to summarize what they did, and how they think it helps them answer the BQ. The idea is that by the end of the unit, they will have an entire spread of summaries to draw from when I ask them to write me an essay answering the BQ. What I’d really love to work towards is having my students compose an end-of-semester essay linking all of the topics we studied under one coherent roof. I’m excited about this process because I’ve known all along that Essential Questions were actually quite genius. I just couldn’t figure out how to use them in a way that wasn’t trivial. A single, open-ended question that encompasses weeks (and possibly an entire year) of instruction? How is that not awesome? Sign me up! I also had no idea how to get students involved with them, which I see as the way to best utilize them. …and we could all hear the crickets chirping, I said “if you’re having trouble getting started, look back to page 16 at your answers to the constant speed key question.” Within 15 seconds, the room was bustling with productive conversation. Below are several examples of student work. In just two weeks of using them, I’m rather blown away by the work my students (both AP and college prep) are producing. I’m really excited to see how these will look at the end of the school year. The first few questions are the Key Questions I ask at the beginning of each new activity. I ask them to respond before and after the activity. The second time I ask them to answer it, I ask them to refine their answer by adding more detail. The last set of responses are to my Kinematics “Big Question:” What is motion, and how do we analyze it? An object is moving at a speed that doesn’t increase or decrease as it moves towards it’s target. Zero acceleration. Within equal intervals [of distance], the object will travel with a constant time. Movement at a constant rate of speed. Equal position changes in equal amounts of time. I observed lots of iterations of this progression in responses, so I won’t print them all. Myself and the student have a clear record of them developing more sophistication in their thinking about motion. To analyze data is to observe experimental results or prior studies of the experiment. Gathering information to have an accurate perception of the conclusion. Not only does one require a graph for analyzing information, but other ways present themselves without the use, or need, for numbers. Numbers, though the simplest, are not the only thing to go by when looking at data. I love this response. I think kids come into science class thinking that numbers rule the land, and that science is all about exactness, perfectness, and black-and-white “answers.” Useful data is more than just numbers! The best part is that the day’s lesson was not designed around this important point. The student made this connection on their own. We created motion maps based on [position vs. time] graphs. We found out the importance of the origin and that a flat line on a [position vs. time] graph means the object has stopped. A negative slope line means the object is going back to the origin. What I particularly like about this response is the reference to the meaning of a negative slope. One thing I’ve been pushing is that each and every part of a graph physically means something. I tell my students “you can talk about what the graph literally looks like, ‘it has a negative slope’, ‘this line starts above the other’, etc., but I also want you to tell me what that physically would look like.” We never explicitly talked about what a negative slope on an x vs. t graph means, but this student is on their way to getting the full picture. And, again, they made this connection on their own. Even though this particular point on the negative slope isn’t 100% accurate, it’s a big step in the right direction, and the student was clearly considering the physical meaning of the graph. Today, we made Motion Maps and [position vs. time] graphs. By being able to read a map or graph and then transfer this information onto a graph or map, we are better analyzing our data be seeing it more visually (on the map) and understanding that average velocity is the slope/rate (on the [position vs. time] graph). Yes! My catch phrase for moving between representations is that we’re “translating from one language to another. The words and symbols may look different, but we’re communicating the same concept, just in different ways.” But just because I say it doesn’t mean the student takes it in. However, this student clearly did! We analyze the data of an object’s movement by using a constant velocity model. It shows an object’s position at different intervals of time and allows us to compare the velocities of multiple objects. Ok, I’m sold. Where do I start? I suggest buying the book and reading it cover to cover. Take note of the ideas that you feel good about. I wouldn’t recommend making any big change like this in the middle of the year, but there are certainly things you can do (like key questions/big questions) along the way in preparation for a full switch. I also wouldn’t try and implement the full methodology at first. There’s a whole lot to it, more than I could wrap my head around doing well the first time around. Instead, I’m just going to take it slow. I’ve got a 2-3 year plan in mind for this. Right now, my focus is on writing and metacognition, so I’m focusing on the Key Questions and Big Questions. Action-Reaction Blog, Frank Noschese – Labs, Notebooks, and Reports: For What Purpose? This entry was posted in Uncategorized and tagged lab notebooks. Bookmark the permalink. Trevor- I’m glad I stumbled upon your blog! I teach MS science and am very interested in improving the way I use science notebooks with my class. I haven’t seen that book yet, so I will definitely check it out ASAP. One question for you- how well do you think these interactive science notebooks would work digitally? My school is 1:1, so last year I experimented with digital science notebooks, something that I’m continuing to improve this year. I’m curious how well these would translate from paper to computer. I’m honestly not sure how well it would translate. As someone who used notebooks on a day-to-day basis when I was doing research science, being able to jot my ideas down immediately in whatever form I thought was most useful was the advantage to having a notebook. With tablets and Evernote (and it’s new handwriting extension), I can see it translating nicely. Or even laptops with touch screens that can flip to a tablet-like configuration. However, without that, I’m not sure all of the advantages to a physical notebook would translate. However, the Big Question portion, I think, could translate nicely along with all of the other reflection-type stuff. A student-made blog would do this wonderfully, I think. 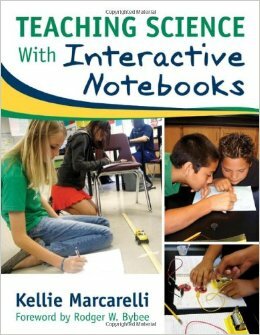 I found your post when I googled interactive notebooks- this is a super helpful post, thank you! I bought the Marcarelli book and am loving it. I’m glad to hear I could be of help! While what I actually do is quite different in many regards to what Marcarelli writes about, her book was still a great way to get me thinking about what a good lab notebook looks like.